0-20 subtraction worksheets consist of highly interactive column and horizontal problems with few word problems interspersed in between. 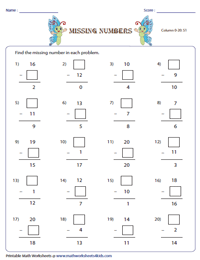 You will find an array of visually engaging theme-based worksheets, exercises on finding missing numbers and equivalent subtraction sentences. A number of eye-catching and fun-filled worksheets under topics like decoding the riddle, multiple responses, connecting the subtraction sentences are provided for ample practice. A perfect set of first grade worksheets with a combination of 1-digit and 2-digit numbers subtracting in columns. Kids may start with simple subtraction problems and progress to solve the word problems. 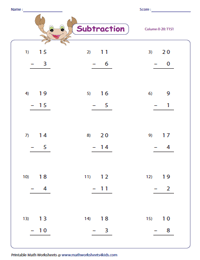 These worksheets help kids reinforce the skills in 0 to 20 horizontal subtraction. A few worksheets are interspersed with real-life word problems to understand day-to-day life subtraction. Are you ready to ride the spaceship? This series of vibrant worksheets will be a sure-fire hit with little ones! Download the printable worksheets for a fun-filled learning experience! 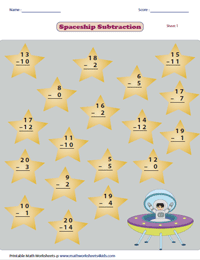 These sheets refine children's logical reasoning in 0-20 vertical subtraction. Fill in the missing numbers that yield the differences projected in each worksheet. Recommended for 1st grade and 2nd grade. 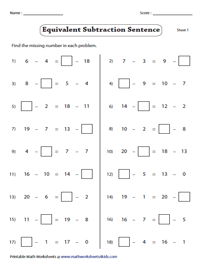 Test your 0 to 20 subtraction skills with the pdf files that can be downloaded here. Figure out the missing number that makes the subtraction equation true in each problem. 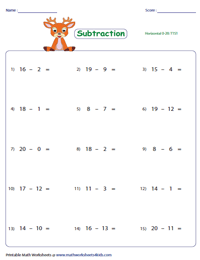 Refresh your mind with this cool set of 0 to 20 subtraction worksheets! 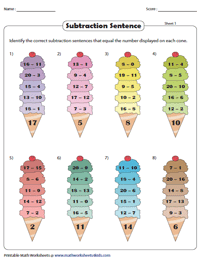 Select the subtraction sentences that match the value displayed on the ice-cream cone. Use the answer key to verify your solutions. Kids are sure to fly high with this set of worksheets! 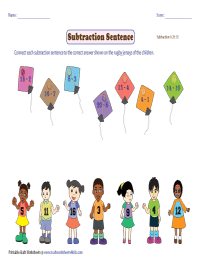 Match the subtraction sentences on the kites with the numbers displayed on the jerseys. Use the download button to grab all worksheets in a single click.